This is the Dashboard view in a normal width module – just click anyway to see the content. With our recent updates to add a “tour” view and secure our tour links (using https), you can now use simple embed or iframe code to embed the whole virtual tour into a blog post or a listing page. Embed your virtual tour right into your own blog or website to leverage the amazing content created and keep people on your site! It works great on both desktops, tablets and phones. We recognize the user’s device and adjust accordingly. The easiest way to get the code is just to the Marketing Center and click the Tour Links button (Manage Tours>Photos & Marketing Tools, then the Tour Links button). 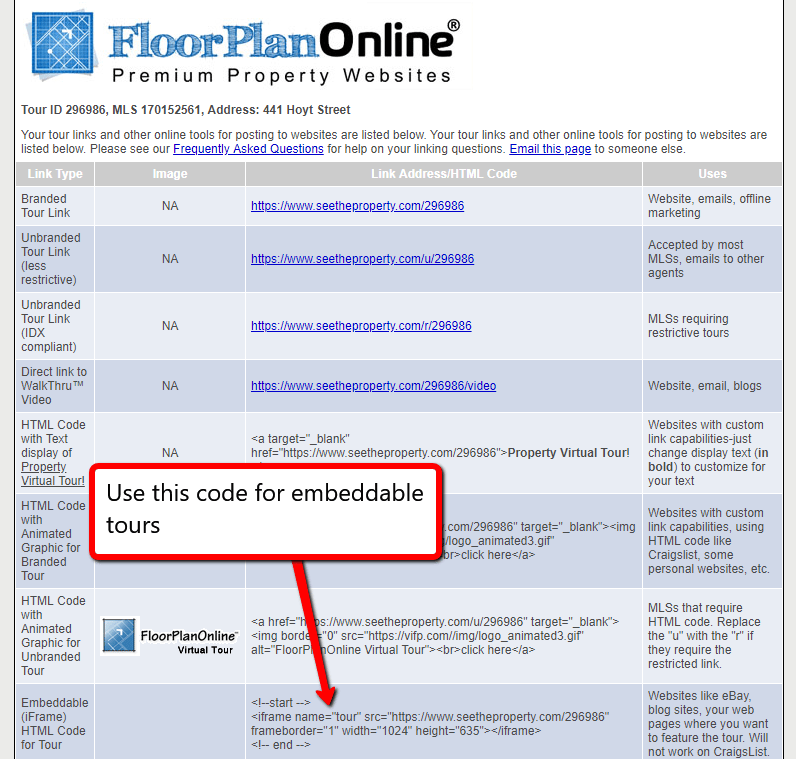 From there, you will see the Embeddable Code section – just copy and then paste this code into a blog post or the listing page and the tour will magically show up. Because our tours are now secure, it will also work if your website is secure too! Note it differs slightly than what we provide on the links page because it sets the width to 100% of the area assigned to the embed code, which makes it better for responsive sites. It also puts the border at 0 (so no border shows) A defined pixel width will also work for the width, like 1200. All you need to do is change this code here to your right tour ID. And you can have both the Tour and the Story active. Our URLs now support a default view (what you select as the tour frame when you first create a tour), but also separate Story and Tour links. You can see the words story or tour in the URL. So if you want the Story to be your default view that gets linked to the MLS, Zillow, Realtor.com, etc, use that at the main tour link and/or set the default to Story, but in the embed code you can still use the tour link option and embed the tour into your page, which would be better than the Story. Pretty cool! The only difference between branded and unbranded is a /b or /u at the end. We will be updating our embeddable content module down the road, but until then this option is pretty flexible. Depending on how you can adjust your website, you may be able to show it as a full width content section tool.